This is the quintessential Sri Lankan bike ride! On this two week trip, you will discover local tea plantations, small villages, and historically significant cities — along with some wonderfully diverse riding through a sizeable portion of the island. You'll cycle from the culturally rich north through tea country then down into the southern plains and Horton Plains National Park, finishing in Galle. This trip is best enjoyed by people with previous biking experience. Expect to be biking between 5 and 62 miles on most days of this trip. Although the cycling is not exceedingly strenuous, and a support vehicle will be available at all times during the ride, it is best to come prepared with a medium level of biking fitness in order to fully immerse yourself in the adventure. 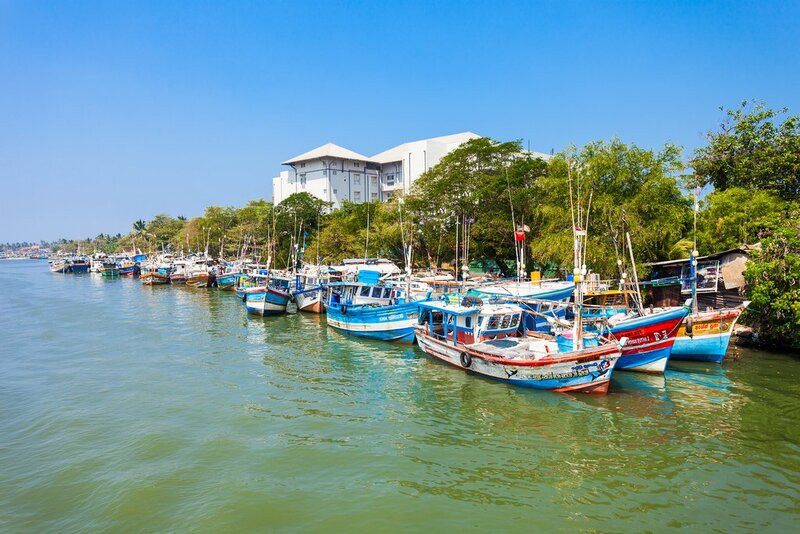 Arrive in Colombo, Sri Lanka's capital city, just 20 minutes away from today's destination: Negombo. An airport pick-up will transfer you to the hotel for check-in, before meeting your tour leader for the trip. You will receive a trip briefing, followed by a bike fitting session, then drinks and dinner. The beaches of Negombo are centrally located for an evening walk to stretch your legs. Your first day on the trail starts with a car transfer northeast of Negombo. Along the way, you will pass a Hindu temple where you can stop for a look inside. Eat lunch at the start location of today's ride where you will be dropped off, and after a chance to digest, it's time to hit the road! The 14.3-mile route today is mostly on hard, packed-dirt roads along canals and through dry forests. There are hardly any vehicles to contend with and there will be lots of encouragement from the local villagers, who are sure to be amused by the group of foreigners wearing brightly colored cycling gear. Roll into your comfortable resort property in Sigiriya in the late afternoon, in time to enjoy the pool and a beautiful sunset. 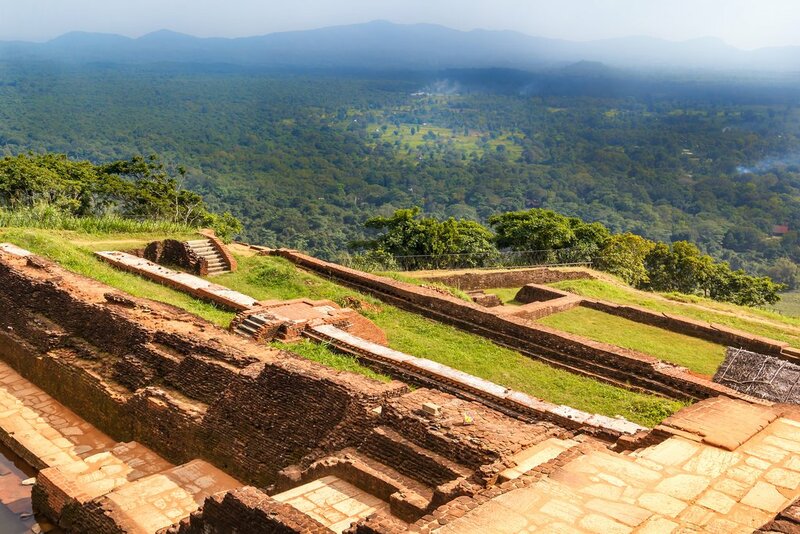 Today you will spend the day exploring the Cultural Triangle of Sigiriya, Polonnaruwa, and Anuradhapura, a historically and culturally important area for the ancient Buddhist kingdoms. Traveling from one point of the triangle to another takes a little over an hour in the car, but in ancient times, this area was a sizable one. 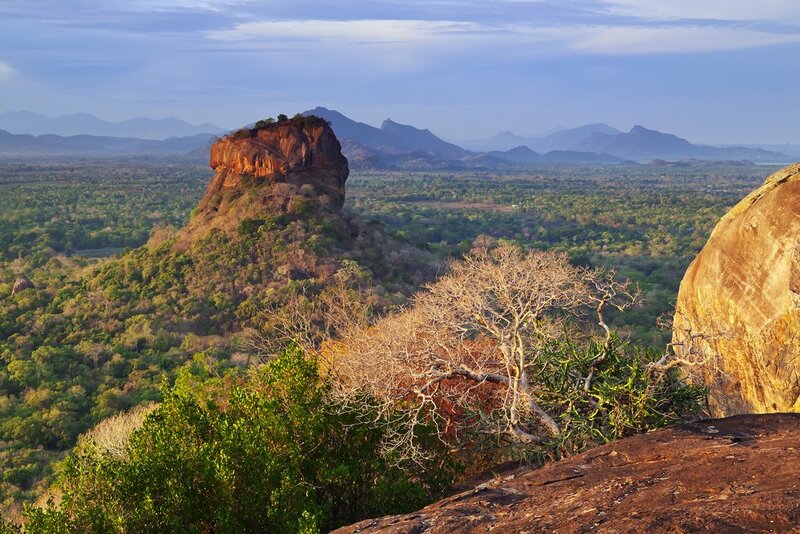 In the morning, visit the Sigiriya Rock Fortress, an area with a colorful history. A 5th-century king who repelled Indian invaders and reunited the country was killed by one of his sons. The son then fled to a massive rock to find refuge but encountered a group of meditating monks already there. The monks were then moved to a temple atop a nearby, smaller rock. That rock-top temple is Pidurangala, a short distance from the fortress. Today you will be visiting both of these sites. Both are a lovely walk and the views are stunning. In between, enjoy a peaceful bike ride. The 34-mile ride is a loop route on mostly traffic-free unpaved and paved roads. There will be time to stop at a few villages to enjoy a cold coconut juice and a chat with the locals. Wake up early for a chance to enjoy the cooler air while you bike, and arrive at the cave temples in Dambulla before the crowds. The cave temples date back to the 1st century BC when people likely lived in these caves. The temples are built under a large overhanging rock, and in 1938 underwent the construction of additions, including colonnades and gabled entrances. After exploring the caves, hop back on your bike and continue your ride towards the hills. Those hills start to build throughout the rest of the day, first in uphills and downhills. Toward the end, there are some sustained uphills for around 7.5 miles. The support vehicle will be on hand for those who don't enjoy this sort of riding, but for those who do, it is very enjoyable as the gradient is quite manageable once you find a rhythm. The total ride today is 50 miles. Stay tonight in two tea plantation bungalows near the small town of Rattota. One is in more recently refurbished than the other, but both are in stunning locations, set among the tea plantations with views out over the hills. Enjoy a delicious dinner in the bungalow. Start out by descending the 7.5-mile road that leads to the bungalows and then passes through Rattota. The markets will be spilling out on to the main street as sarong-clad villagers do their daily shopping. Stop here for samosas and other delicious nibbles. Push on and enjoy a section of gentle uphills and downhills on a fairly quiet road, where you will find your next set of hills. There are two sustained uphill sections of around 3 miles each, and once you reach a certain point on the edge of the ridge, enjoy a downward trend as you head towards Kandy. Pass through some picturesque villages and the Hunas Falls before coming into a bustling town where you stop for lunch. Today's ride is 32 miles. After lunch, it is only a short pedal into Kandy. Approach the city from the northeast and cross the Mahaweli River on a footbridge, thereby avoiding the really busy areas. 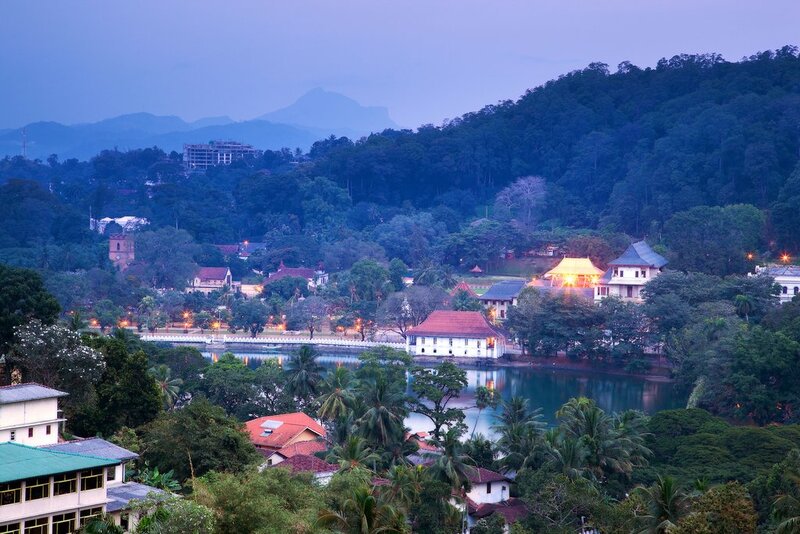 Before you know it, you are over one last hill and into central Kandy. Rise at dawn today to join the pilgrims for a visit to the Temple of the Tooth. This is an ornate temple in the middle of town that contains a tooth relic of the Buddha. After observing the daily rituals, start your day's cycle to Gampola — 28 miles in total. 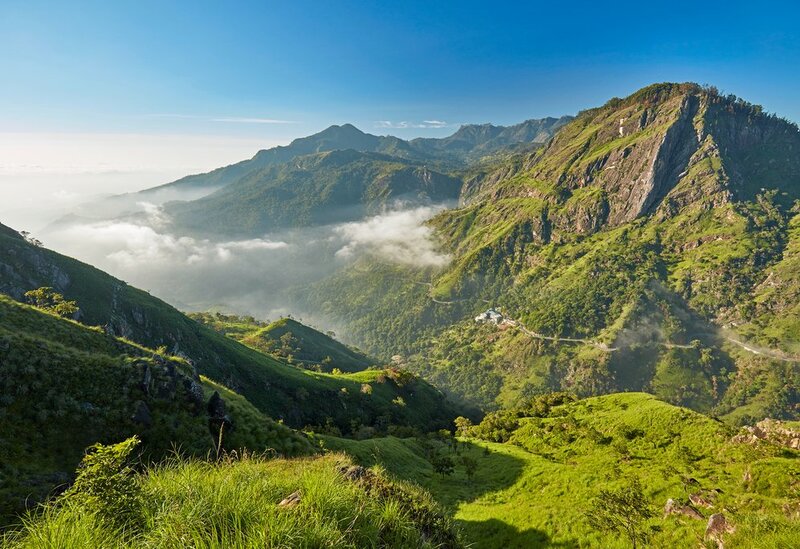 The train journey from Gambpola starts in the flat territory, but once you clear the first hour or so, it is a terrific experience, passing through wide open green valleys where, in the wetter months, waterfalls come cascading off the cliffs. Pass through hilly terrain where tea plantations are a familiar sight, and after some lively conversations with friendly Sri Lankan train riders (probably about cricket), roll into Nanu Oya. A short drive then takes you up to Nuwara Eliya where your comfortable hotel is home for three consecutive nights. In the morning, set off on a ride around the lake and then down a fast, well-paved road before you reach what is now the familiar pattern of winding roads on a comfortable gradient. Then follow the railway line, passing through the high country train stations that may look like mere whistle stop locations, but are very important to the locals who live up here. Grazing dairy cows are a common sight as you pass through Ambewella and then turn around and come back to Nuwara Eliya on a different route, stopping at a fully operational tea factory on the way. After a 28-mile ride, arrive back to the hotel in time for a cozy open fire and hot soup in the charming, colonial-era hotel. The incredible views from World's End Lookout are a highlight today — don't forget your camera! A very early start is needed today for the car ride up to the Horton Plains National Park. Walk along a fairly well-made trail out to World's End Lookout where you can take in the stunning views of the valley. If you would like, take a detour from the car on a quieter trail to see if you can spot any deer or monkeys. After the walk, jump back on your bike for the rest of the day's 28 miles and take a thrilling downhill ride through a lush valley where you will see farmers hard at work. 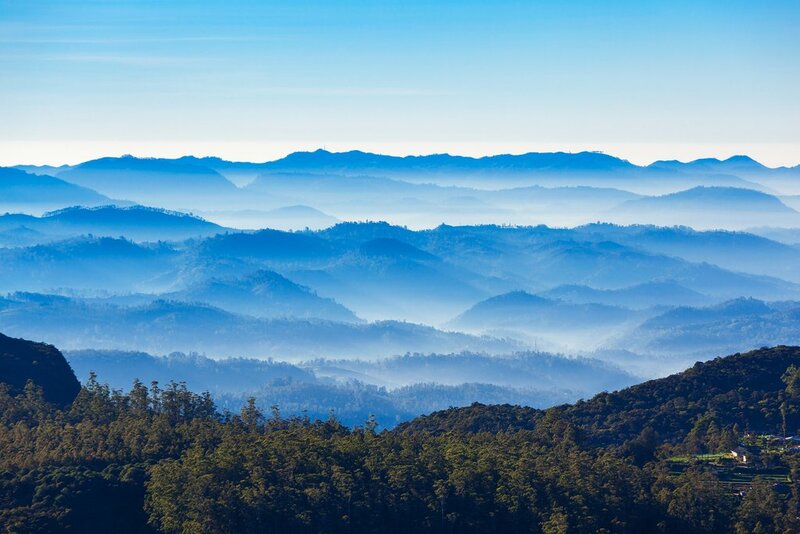 Pass through the bustling town of Bandarawela before stopping in Ella, a small town that caters to weary travelers. A few more climbs start you off today through stunning tea country and small villages. You will see some amazing views this morning on the first leg of today's 37-mile route. After morning tea, settle into your long descent back to the flatlands. The downhill stretch lasts for around 12.4 miles until you reach your lunch stop. Catch a 45-minute ride with the support vehicle to the next destination, as this section of the road is a bit busy and hot. Your destination, Kataragama, is an important pilgrimage location for Buddhist, Hindu and Muslim peoples, and has a long history dating back to the 1st century BC. Once you have had a chance to check in and change clothes, a Jeep will be waiting to take you into the Yala National Park through the northern entrance for your safari. This end of the park is quieter, and you will have time to wait by the reservoirs for a chance to catch a glimpse of rare wildlife like elephants and possibly even leopards! Don't forget to stop throughout the day to take photos! Today is the last hilly day! Start today's 43-mile ride on rolling hills, and as the day goes on and you start to enter the tea plantations again, you will gain elevation. Some of the climbing is on that nice, gradual gradient, but there are some quite steep sections towards the end of the ride. Of course, the vehicle is on hand as needed and your support team staff are experts at encouragement. You'll arrive at the rainforeeco-lodgedge in the mid-afternoon. This is a nicely situated property, with bungalow rooms that are built with used shipping containers in the design. The common areas are inviting and the temperatures drop enough in the evening that a cozy open fire is welcome. 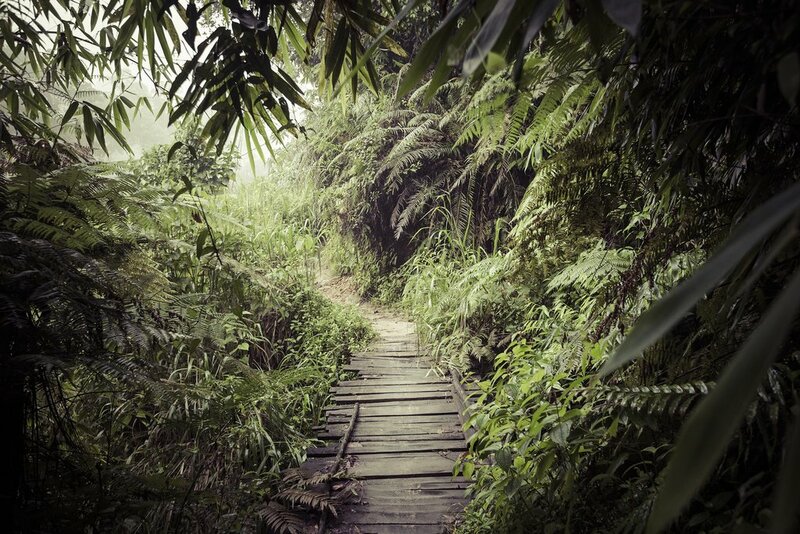 Today you will have a chance to go for a guided walk in the protected rainforest. Sinharaja was designated as a Biosphere Reserve in 1988 and due to the steep terrain, the area had been spared the worst of commercial logging. The forest is quite dense, tropical evergreen, so the mammals are hard to spot, but there are many species of birds, and you are very likely to see them in their natural habitats. The walk will take you through to midday, and you can expect to be back at the lodge by early afternoon. In the evening, after a nice meal and a relaxed stroll, gather around the outdoor fire as you listen to the sounds of the rainforest transition into nighttime around you. Today you reach the coast- celebrate! 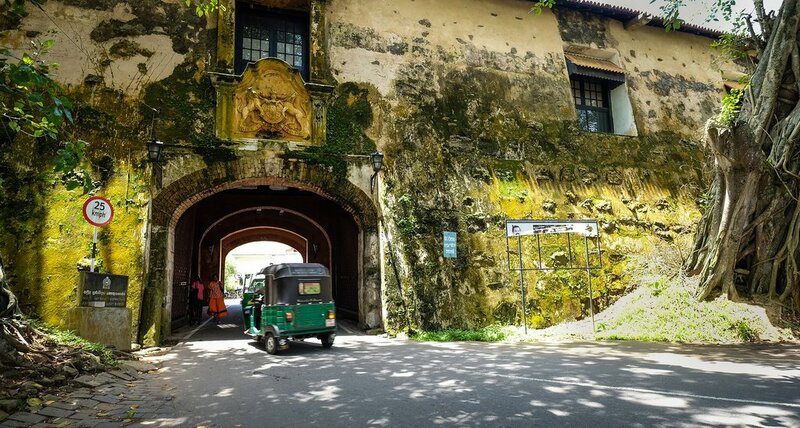 Your last ride of the trip is one to remember as you pedal 62 miles all the way from the rainforest lodge to the coast and the old port city of Galle, where the old fort staunchly defends a city full of pretty historical houses and quaint cafes. The ride is on a well-made road with a little more traffic than you have experienced to date, but still very enjoyable. There will be a lot of downhills, then quite a lot of flat stretches as the road leads into the coast. In the late afternoon, take a walking tour to explore the Galle Fort, then enjoy dinner at one of the top restaurants in the fort. This morning is yours to enjoy as you choose. From here, catch a ride to the airport, or back to Colombo, a 4.5-hour drive up the coast. 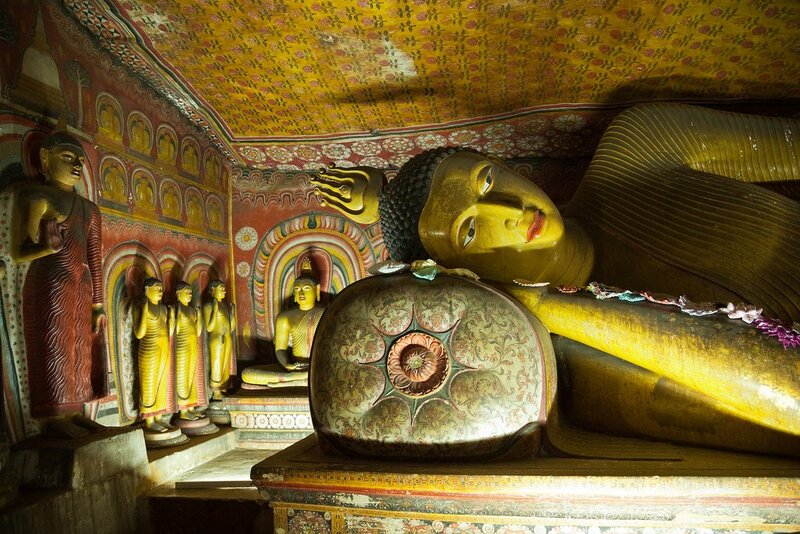 If you choose, extend your stay in Sri Lanka — there's plenty to see and do! My husband and I did the cultural tour with Grasshopper Advenures and it was absolutely spectacular!!! We did this as part of our honeymoon and we couldn’t have wanted anything better! Nishan our guide was fabulous, and our driver Sidit was always there if we needed him! The accomodation on the tour was out of this world - every night was different and showcased a different cultural side to Sri Lanka. 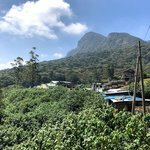 This tour took us all over Sri Lanka from the beaches up into the moutains, riding on backroads and through little villages meeting the locals. We would recommend this tour to anyone who loves advenure, culture, exercise and good food.